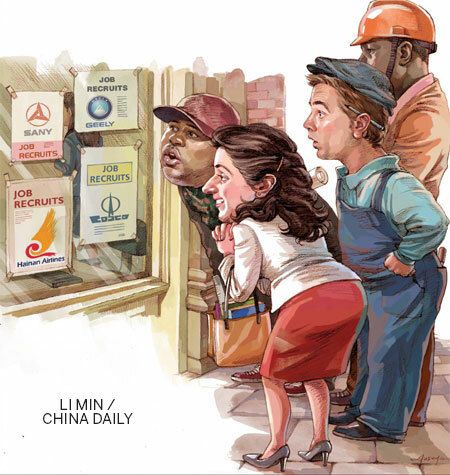 Though Johan Cheval has never been to China, he rarely begins a day without checking on the latest developments there including job announcements made by Chinese companies expanding in Europe. Sitting in his office at Brussels International Airport in Belgium, Cheval, a key account manager for Hainan Airlines, says the growing number of Chinese companies in Europe are creating more opportunities for local job seekers, as grim economic prospects have virtually put a brake on new hiring and strained retention prospects for existing employees. Cheval began his career with Belgian carrier Sabena (now Brussels Airlines), then worked for Scandinavian Airlines for 10 years until September 2012, when poor economic conditions led to him being laid off. Luckily for Cheval, he did not have to wait long. His exit from Scandinavian Airlines coincided with a move by Hainan Airlines to expand its operations in Brussels. "I was one of the eight people recruited locally by the Chinese carrier," he says. Hainan Airlines is just one of several Chinese companies that are creating new jobs in Europe to not only offer sustenance, but also help fuel the outbound push by Chinese enterprises. Sporting a Hainan Airlines badge on his lapel, Cheval says that he has begun contacting other agencies in Belgium to expand business for the Chinese carrier. Professionals like Cheval can play a big role in developing business for Chinese companies as they have advantages like professional training, rich working experience and market contacts. "Getting used to the flow of work, however, is not as quick or fluent as it would be in a European airline. I would say that it is quite a normal and logical process as attitudes, character and culture are different in Europe and China. It is a challenging challenge," he says. Cheval goes on to add that with American Airlines announcing a further scale-back in operations and a possible exit from Brussels, there may be more opportunities for Chinese companies to play the role of a white knight in Europe. "I am confident that Chinese companies will stay in the market," he says. Unlike their peers from the US or Japan, Chinese companies have been rather late entrants in Europe. In fact, most of them arrived after 2008, a time when the debt crisis was raging across the continent. Despite their late entry, they have more than caught up with competition and are now among the major job creators on the continent now. Not only have Chinese companies created new jobs, they have also played a vital role in saving ailing factories and existing jobs. However, there are also several challenges that Chinese companies need to overcome to fully get into the thick of things in Europe, experts say. Chen Mingqiong, general manager of Hainan Airlines Brussels office and Cheval’s supervisor, says: "European employees are now learning to adapt to Chinese corporate culture, while Chinese companies are trying hard to understand the local culture." Chen says his role is more or less that of an "in-between", through whom Cheval communicates with the company headquarters in China. "It is important for Chinese companies to be more open and flexible in their views if they want to reduce the cultural gap in Europe," Chen says. Realizing the importance of the cultural gap problem, many Chinese companies are now conducting frequent "cultural training" programs to keep their European and Chinese employees on the same wavelength. Chen says Hainan Airlines frequently conducts such programs at its headquarters in Haikou, Hainan province. "There is a special program for foreign staff in Haikou that I will be attending soon. It will be my first visit to China," Cheval says with anticipation. "China is such a huge country with a lot of inhabitants and a very rich historical and cultural background." The Chinese carrier has teamed up with Brussels Airlines for expansion in Belgium and also set up offices in Berlin and Zurich to further its European plans, which include adding more local employees. The recent purchase of a 48 percent stake in the France-based Rhine Airlines will see the airline further expand in Europe and thereby add more jobs. Merger and acquisition deals by Chinese companies in Europe first surpassed European M&A investment in China during the first quarter of this year, with 32 investments from the Chinese mainland in Europe against 26 deals in China, according to a recent report published by global accountancy firm PriceWaterhouseCoopers. "This marks the first time that deal flow volume has been greater to Europe than to China," the report says. The report, named China Deals; A Fresh Perspective, shows there has been a steady rise in the value and volume of Chinese mainland investments in Europe over the last six years despite recent signs of a slowdown in China’s economic growth and the continuing uncertainties of the eurozone crisis. Chinese M&A investments in Europe increased from just 11 deals in 2006 to 61 in 2011, while those from Europe to China declined from a peak of 163 deals in 2006 to a low of 85 in 2009. "If historically European investors have been more acquisitive in China, the gap in deal flow between Europe and China is narrowing," the report says. China’s state-owned enterprises have been M&A trailblazers in Europe, the report says, adding that more Chinese companies are expanding there. According to the PwC report, there has been a sea change in the traditional investment relationships with various European nations. The report says that Germany and France have become the prime candidates for Chinese investment overtaking the old favorite – the UK. Germany has emerged as the most popular destination for Chinese investment and also as the location for the European headquarters of most Chinese companies. Christine Stock, deputy section manager of COSCO Europe GmbH, a unit of the state-owned conglomerate COSCO, says the company has more than 170 local employees at the Hamburg head office of COSCO Container Lines Europe and at its branch offices in Bremen, Frankfurt and Dusseldorf. It also has 25 German employees at COSCO Logistics and COSCO Europe Bulk Shipping GmbH in Germany. According to Christiane Linkenbach, head of marketing & corporate communications at heavy machinery maker Sany Heavy Industry Germany GmbH, says the Chinese company will soon come out with new structures and strategies for improving production in the future. Sany acquired Putzmeister, a German company, early this year. According to latest estimates, the number of qualified German professionals working directly or indirectly for Chinese companies could well run into several hundred thousand, experts say. Walter Schuhen, PR and marketing director of Dusseldorf China Center (DCC), is just one of such several Chinese-speaking German professionals. Schuhen has worked for more than three years with DCC, a platform for economic and cultural exchanges between German and Chinese professionals working for private companies, governmental and non-governmental companies. Schuhen has so far made five visits to China. "But in the future, the plans are for me to spend at least three months in a year in China to manage projects inter-continentally," he says. Like many fellow Europeans, he says that China is a fascinating country with a long tradition and history and speedy economic and social development. Schuhen says that the general consensus among most German employees when dealing with Chinese companies is a sense of security. To some extent, it has also been fuelled by the increasing number of employees Chinese companies are hiring in Germany, he says. Schuhen says that Germans are generally used to long preparation periods and planning cycles, stricter regulations and rules. In contrast, the Chinese are more spontaneous and flexible. "The most impressive feature has been the speedy decisions that are taken and implemented by Chinese companies," he says. According to data provided by Eurostat, the statistics office of the European Union, Germany leads the list of countries in the eurozone that are the least affected by the debt crisis, with an unemployment rate of 5.4 percent during the third quarter of this year. This is merely half the average rate of the European Union’s 27 member states. While the job opportunities offered by Chinese employers does add the extra sheen to an already resplendent German labor market, other EU member states are leaving no stone unturned to attract additional investment from Chinese companies. Sources from Invest in France Agency (AFII), a government body that promotes and facilitates foreign investment in France, says that the total value of China’s investment in France reached $1.8 billion by the end of 2011 and created more than 6,000 jobs. In 2011, 17 job-creating investment projects were announced to generate 696 jobs in France, making China France’s 10th largest investor. The business activities prioritized by Chinese companies were decision-making centers (35 percent) and production/manufacturing units (30 percent). A majority of Chinese investments involved site creations (71 percent). In 2011, six new investment projects from Hong Kong Special Administrative Region were set up and they led to the creation of 318 jobs in France. There are about 60 HKSAR subsidiaries in France, employing more than 6,100 people. In 2011, France was the third-largest recipient of job-creating investment from China, hosting 13 percent of Chinese projects in Europe. With 15 percent of investment projects, Germany was the leading recipient of Chinese investment projects on the continent, followed by the UK, which attracted 14 percent of these investments. China Guangdong Nuclear Power Holding Co, one of the nuclear sector’s leading companies, specializing in engineering, installing and servicing nuclear plants, opened its subsidiary China Nuclear Power Engineering Company Ltd in Ile-de-France (Paris region). The new entity is expected to employ about 30 people. Commercial Aircraft Corp of China, which specializes in designing and manufacturing civil aircraft, decided to locate its European headquarters in the Paris region. Twenty new jobs are likely to be created by the company. Rotam Cropsciences Ltd, a HKSAR firm which specializes in distributing, marketing, manufacturing and R&D in phytosanitary and veterinary products, has decided to expand its Rotam Agrochemical Europe site in the Rhone-Alpes region, to focus on producing insecticides, fungicides, growth regulators and plant and animal nutrients. The investment project will create another 20 jobs. The UK has always enjoyed a special bonding with Chinese companies and was one of the destinations actively pursued during the early years of outbound investment. Though others have overtaken it in the investment race, it still remains an active destination. The UK is now home to more than 400 companies from the Chinese mainland, according to the UK Trade and Investment. Chinese investment in the UK has increased from virtually zero during the 1970s to more than $2.3 billion last year, says Liu Xiaoming, China’s ambassador to the UK. In September, Chinese telecoms and computer network giant Huawei Technologies announced that it would invest and create more jobs in the UK as part of its overall expansion plan in Europe. Huawei employs 800 people in the UK and plans to increase that to 1,500 over the next five years as part of the 1.3 billion pound investment and procurement program in Britain. British Prime Minister David Cameron said the investment demonstrated that the UK is "open for business" to Chinese companies. "I welcome this and I want to see more companies invest in the UK as we work to achieve sustainable and balanced growth within our economy," Cameron said. Victor Zhang, chief executive of Huawei Technologies UK, had termed the investment "the beginning of an exciting new period of development". Huawei first came to the UK in 2001 and the company will move its headquarters from the current offices in Basingstoke to Green Park in Reading by April 2013. "Huawei is providing important investments in the UK and creating hundreds of new jobs for Reading and Green Park, demonstrating once again that Reading is an economic powerhouse in the South East," Reading West Member of Parliament Alok Sharma says. MG Motor UK, a wholly owned subsidiary of Shanghai Automotive Industry Corp (SAIC), China’s largest automaker, in Longbridge, Birmingham, is another British company that has created strong links with the local community through investment and job creation, says company managing director Wang Hao. Seven years ago, the historic car manufacturer MG Rover went bankrupt, and its assets were purchased by the Nanjing Automotive Company that later merged with SAIC. At that time, the deal had created sour feelings in Brtiain, as many feared that it would lead to massive job losses. All of that has changed and there are frequent outreach programs aimed at building even more strong links with the local community. In 2011, MG Motor and Birmingham Airport signed a formal corporate partnership agreement, highlighting their long-term commitment to the development of trade between Britain’s second- largest city and China. Bank of China London is another Chinese company that has made waves by adding more than 300 local jobs and having predominantly local employees. Apart from Bank of China, there are many other Chinese companies in the UK like the Industrial and Commercial Bank of China and China Telecom that have been slowly, but steadily increasing the quantum of local hiring. According to the Eurostat data, the unemployment rates in Spain and Greece have climbed to 25.5 percent and 25.4 percent respectively by the end of September 2012, making it the first and second-highest among the 27 member states. Slightly better than the situation that one out of every four persons is jobless, the figure for Portugal stands at 15.7 percent, closely followed by Ireland’s 15.1 percent. It is these countries that are fast emerging as alternate locations for Chinese companies looking to expand their geographical presence. Portugal has been one of the big movers and the country has so far attracted investment from more than nine Chinese companies, says Wang Yun, the third secretary of the economic and commercial counselor’s office at the Embassy of China in Portugal. Prominent among the Chinese companies are the State Grid, China Three Gorges Group, Huawei, ZTE, National Development Bank, ICBC, ECADint Group, the Bank of China Portugal branch (under construction), and Wuhan Zhongye Group (under construction). In accordance with their global strategies, Huawei and ZTE, the two Chinese ICT giants have continued to add more employees locally. In Huawei Portugal, 23 out of the total 74 employees are Portuguese. There is an even higher ratio of localization in that 25 Portuguese employees and 15 Chinese colleagues work together at the ZTE Lisbon office. Proportionally, the job chances created by Chinese investors in these nations are relatively far less compared with that in Germany. But on the other hand, the opportunities have always been in line with the economic crisis. If Chinese companies are able to firmly grasp the opportunities, then it would create a win-win situation for both European employees and Chinese enterprises, experts say.